I'm located in Ottawa (Canada) and got my new Soul EV in April 2016. 10 months later and with only 11575km (7234 miles) on the odometer, I found out today that the brakes on the car are seized. The dealer estimated about $200-$300 CAD to fix the issue. I only found out after bringing in the car for it's first maintenance checkup. The only indication I had was the brake noise I would hear when driving in reverse. Then once again when I left the car parked indoors for 3 days, I came back and it felt like the brakes were stuck. Normally the car is driven daily about 38 km, and parked indoors. My garage isn't heated but it is slightly warmer than the outside temperature. I'm shocked to find out the condition of the brakes after only 10 months. I drive carefully, and mostly in "B" mode. I would have expected the brakes to be in great condition. In the end I'm grateful the dealer agreed to cover the cost of repairing the brakes. My concern is will this occur again in 10 months? I think the KIA engineers should have designed the brakes to better withstand winter weather, and the fact that the brakes get used very little due to the regenerative braking. You use "electric parking brake assistance" ? but it's cover by the warranty ... no ? in my contry, the 30 000 km revision schedule a replacment of the brake fluid. Are you referring to the electric parking brake? It is the button located in the center console above the ECO button identified as "((P))". Yes, I do use the electric parking brake when the car is parked indoors. The dealer said the seized brakes were not covered under warranty by KIA. But the dealership agreed to cover the cost anyway.....I bought the car from them, so maybe it was done to maintain a good customer relationship? I'd be interested in knowing why KIA wouldn't cover it. I know that things like brake PADS and tires and other things that normally aren't covered because they're designed to wear out. I wouldn't think that even if your pads had worn out that that would be the reason the brakes seized. The squeak when you backed up sounds like something wasn't working properly. If it was a wear sensor it should have done it in both directions. 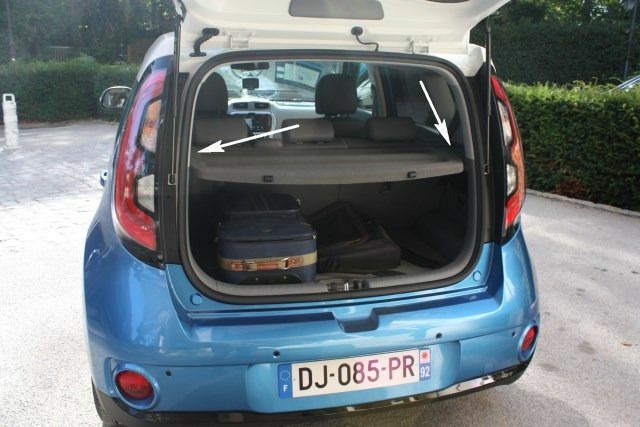 My SoulEV 2016 also makes growling noise coming from rear wheels when car is backing up. I noticed it soon after I've got the car. To me it sounded like parking break is not released completely, but the car is not slowing down when going forward and wheels don't get hot. So I just ignore it. 1.5 year and 40000 km later brakes still seem to work fine, other than that noise. Park in a garage, rarely use parking breaks. Noise can be the arrows ... you must hard press to lock the tablet. Others noises MUST be report at the local KIA seller ... immediatly (a mecanical guy drive with you and you can notice the noise when they appear). I too have had trouble with my parking brake. It was making noise (the whale song sound) while in reverse. Called dealer and he thought dust on the brakes making noise. We live on a dirt road so sounded reasonable. Took my Soul (2016 bought used) to get seat heater repaired and asked to have parking brake checked. The parking brake had not been releasing completely so I had been driving with it partially engaged. This damaged the rotors. Dealer said it was not a warranty issue because my 12volt battery was out of warranty and low which caused the parking brake to not completely disengage. If this is correct - stupid design. I could still hear the parking brake engage and disengage like normal when it was supposedly not completely released. How would I know when the battery is low and not completely releasing the parking brake? I guess I will have to pay attention to any unusual noise when backing up. Waiting on an answer to this question from Kia. Posted only to have this info online for others. That whaling noise from the rear when backing up is a stuck parking brake? My car has been doing that for over a year and I've been ignoring it, since it just sounded like squeaky suspension. When I bring in the car for service next time I'll have the dealer take a look at it. On the other hand, if it can cause damage to the rotors maybe I should have it look over sooner Please do keep us updated. CarnationSoulEV wrote: Dealer said it was not a warranty issue because my 12volt battery was out of warranty and low which caused the parking brake to not completely disengage. That is rubbish. When the car is turned on the DC/DC converter will be providing 12V power to charge the 12V battery and run all the 12V electrics including the parking brake. A low 12v battery will only affect things like lock/unlock and the initial turning on of the car. Once the car is turned on then the DC/DC converter is powering everything.